This is a great introduction to working with leather using just a domestic sewing machine. In this workshop, you will learn about the quirks and joys of working with leather and will make a fabulous tote bag with grab handles and an interior pocket. You will be taught how to use a sewing machine to sew leather effectively and move on to using top stitiching on the interior pocket. 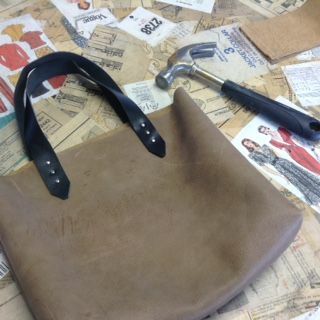 You will also learn how to attach handles to the bag using rivets. We provide all the materials needed and have eight wonderful Brother sewing machines to work on. This workshop is ideal for those who have some sewing experience.